The kukui nut tree in Hawaii. 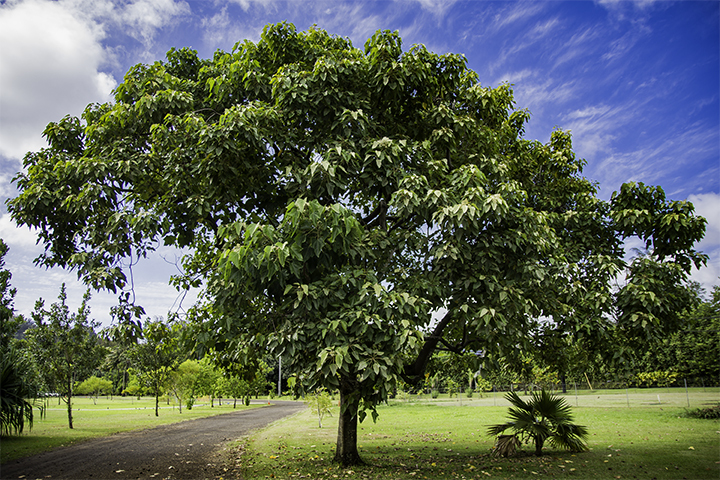 The official state tree of Hawaii is the kukui nut tree or kukui tree. It’s known elsewhere as the candlenut tree. Historians consider the kukui nut tree in Hawaii as one of a number of “canoe plants.” This because the Polynesians brought such seeds with them in canoes when they first came to Hawaii. The kukui nut tree in Hawaii has large light-green leaves. It can grow up to 80 feet in height. And it usually extends wide and tall into a distinct oval-shaped tree top. The kukui nut tree in Hawaii has played an important plant in traditional culture and lifestyle. The nut was particularly useful. Hawaiians used the oil from the nuts to coat fisherman’s nets or to illuminate candle-pods. The outer shell of the rich-colored nuts became a natural dye for tattoos. Also, Hawaiians utilized kukui nut oil as topical dressing for massaging sore muscles, soothing burns, chapped skin and wounds. One can roast and chop the white insides of the nuts. The ancient Hawaiians have used it as a spice that they called inamona. Inamona still remains a key ingredient in poke, a popular dish made with raw fish and limu (seaweed). You can often find poke served at luaus or as an appetizer at many types of gatherings in Hawaii. The light-colored nut oil is practically odorless and a person’s skin can easily absorb it. It blends seamlessly with most lotions and creams as it is high in alpha-linoleic and other fatty acids. At farmer’s markets, you can find kukui nut oil as the primary ingredient in soaps, candles and body lotions. People also use it as a hair follicle stimulant, in lomi lomi massages or even as a laxative. Other parts of the tree has many uses. Ancient Hawaiians used its durable wood from the trunk to make canoes. They also crushed the root to make black paint on canoes or on tapa cloths. People even used the leaves of the kukui nut tree to treat sore joints, fevers and headaches. While the ancient Hawaiians used the sap of the tree to heal cold sores, chapped lips and mouth ulcers. Kukui nut lei. Image courtesy of Dawn Freitas. The tree holds much symbolism for Hawaiians. The kukui nut represents protection, peace, enlightenment and light. Kamapua’a, the Hawaiian demi-god of fertility, would be able to take the form of the kukui nut tree before changing back into his half-hog, half-man form. Even those unfamiliar with this tree have probably seen the kukui nuts strung together in leis. 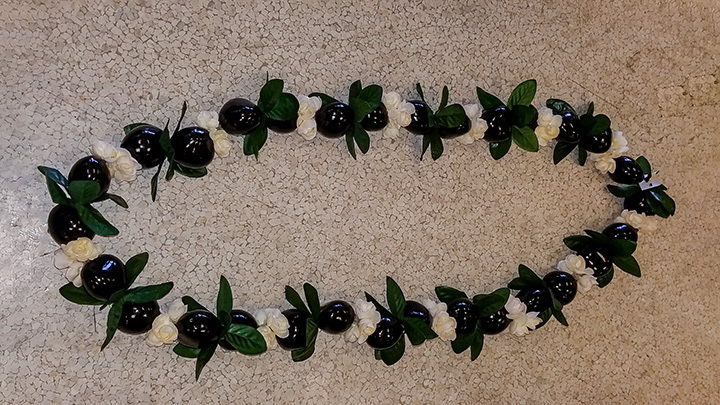 Kukui nut leis are standard adornments at many traditional Hawaiian events. Here, kukui nuts are typically sanded, buffed and polished into dark brown, black or white finishes. The nuts can be laced together by themselves or interlaced with shells and worn as a lei or bracelet. In the past, people have used kukui nuts as prayer tokens in order to capture one’s spiritual energy. Hula dancers, kahunas (priests) and aili’i (royalty) often wore them. Couples also exchanged kukui nut bracelets during marriage ceremonies. The delicate white kukui blossoms are the official flower of the island of Molokai. These can be strung as leis. When its flowers are accessed by bees, they can create kukui honey, one of the more unique honey products in Hawaii. It is no mystery why the kukui nut tree deserves to be the Hawaii state tree. This is because so many aspects of Hawaiian history and culture include the kukui nit tree.